‘D’ wins two-minute drill: The first-team defense prevailed over the first-team offense in the two-minute drill, forcing Brandon Weeden into four straight incompletions. D’Qwell Jackson was disruptive, sacking Weeden and batting down one of the passes. Seneca Wallace was up next and fared better against the second-team defense, opening with a deep ball to Josh Gordon and finding him again for another short completion. The drive ended on a 41-yard field goal by Phil Dawson. Weeden got another crack at the two-minute drill, this time against the second- and third-team defense, and produced a 45-yard Dawson field goal. Dawson’s bionic leg: He keeps getting better with age. 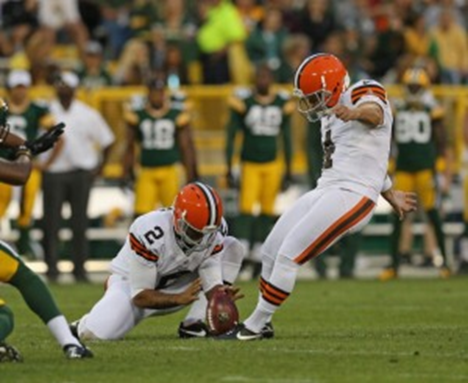 Dawson, who made kicks of 52, 47 and 53 yards in Green Bay, boomed a 62-yarder in practice Sunday. Injuries: Tight end Ben Watson, receiver Rod Windsor and Jackson (shoulder) returned to practice. Rookie linebacker Emmanuel Acho has been out the past two days (no details). Defensive end Frostee Rucker (knee) was limited. . . . Rookie offensive lineman Ryan Miller walked inside with a trainer during practice. Schedule: Today’s practice is closed to the public. Tuesday and Wednesday are open from 8:45 a.m. to 11:15 a.m. For updates, call 877-627-6967. Markus Kuhn: "He looks like the real-life Thor"